Vice News produces a weekly news episode, documentary style, each featuring two specific topics relevant to society today. 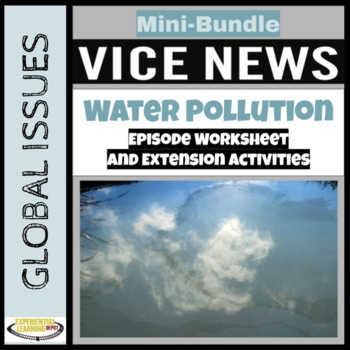 This particular bundle includes episodes specific to water pollution. Watching the episodes and completing the extension activities provided in this bundle is a great way for students to stay informed, problem solve, and stay connected to their local and global communities. Teaching duration is flexible depending on how you make use of each lesson. Episodes are all approximately 15 minutes long. Watching the episode with class discussion takes 30-45 minutes depending on depth of conversation. The length of time dedicated to an extension activity varies depending on which activities you choose to use. Videos are available free via Vice on Youtube. Links are provided on the product. Warning: Vice content is for mature audiences. I recommend using this product for high school students, college students, and adults. If you like this product, check out these activities as well! Some are directly related. Watching Vice episodes is a great segue to project-based learning. My students almost always want to continue on with the topic after watching an episode. It's input or information that grabs their attention and makes them want to learn more. I highly recommend combining Vice videos with "Project-Based Learning: Current Events" and "Community Action Projects".